When you visit Biglots.com and join the Big Lots Buzz Club Customer Loyalty Rewards Program, you become eligible for a 20-percent discount on your Big Lots purchases. You'll also be alerted to specials, promotions, deals and limited time offers before they're advertised to the general public. You'll receive advance notice of new products delivered via e-mail throughout the year. Sounds good, doesn't it? But the program comes with both pros and cons. First, the pros. New members receive $5 off a $15 Big Lots purchase just for registering in the Big Lots Buzz Club Customer Loyalty Program. You must consent to receive e-mail marketing messages at the email address associated with your Buzz Club membership. 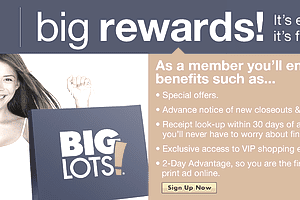 You must keep and present a Big Lots Buzz Club membership card with every in-store purchase. You must maintain an accurate profile with true and correct profile information. Buzz Club members-only deals and discounts cannot be redeemed when making purchases online through the Big Lots shopping website. The primary reason that customers join any customer loyalty program is to receive special members-only deals, discounts, coupons, and exclusive privileges in their shopping experiences. In exchange for all that, the retail company collects and use information about its customers and obtains permission to use that information in its ongoing marketing efforts. Big Lots reserves the right to change or cancel the program at any time, even if that means your benefits and/or earned rewards are diminished or eliminated in the process. If there is no purchase activity associated with your Buzz Club membership for 24 consecutive months, Big Lots may cancel your membership and eliminate any earned rewards or membership benefits that have been accumulated. If you re-enroll, the rewards and benefits from the terminated membership will not be transferable to your new membership. Each member must have his own membership card. It can't be shared with any other person, even members of his immediate family. Membership is not transferable to any other person, not even in the event of divorce or the death of the registered Buzz Club member. Neither the program benefits nor the Big Lots Buzz Club program membership are redeemable for cash. Big Lots is "not responsible for the failure to make Program benefits available." Disputes about any aspect of the Buzz Club Customer Loyalty Program will be resolved by Big Lots "at its sole discretion." Fill out the online form at Biglots.com to register for the Big Lots Buzz Club Rewards Program discounts, special offers, and limited-time specials.